In this circuit, an audio signal is amplified and modulated, then sent through an emitting LED. The LED flickers, showing that audio signal is being sent through the LED as a voltage signal. The receiving reverse biased LED is then used to take in the light signal. After amplifying this signal, removing the DC offset, and demodulating it, the original audio signal can be heard when a speaker is attached to the output. To rest the system, block the light between the two LEDs. If the circuit works properly, the music should be muted. The amplitude modulation is created by sending an audio input signal into an operational amplifier circuit. The circuit then provides a DC offset and modulates the signal with a carrier wave of 100kHz. 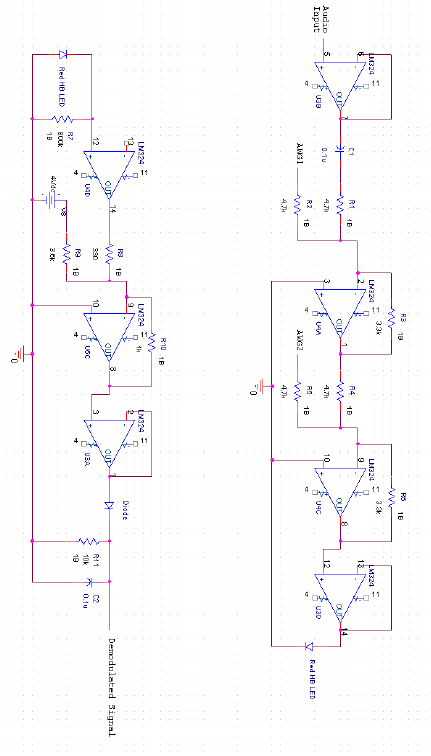 The output of this op-amp is then sent to the red emitting LED. 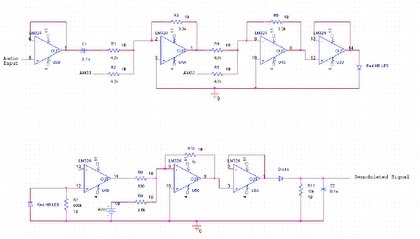 The reverse biased receiving red LED is then connected to another op-amp circuit that amplifies the signal and removes the DC offset. The signal is then sent through a simple demodulation circuit to remove the 100kHz carrier wave. What you are left with is the original audio signal.